Masala chai is the beverage from the Indian subcontinent made by brewing tea with a mixture of aromatic Indian spices and herbs. As with much of Indian cuisine, the exact mix of dry spices varies greatly and is often handed down in families from one generation to the next. Left: A cup of masala chai. By itself, chai is merely the generic word for tea in Hindi, Punjabi and many other languages around the world, and was adopted into British slang as "cha" or "char". However, for many English speakers who refer to ordinary tea as "tea", the word "chai" is a relatively recent addition to their vocabulary and automatically implies "masala chai." The simplest traditional method of preparing masala chai is to actively simmer or boil a mixture of milk and water with loose leaf tea, sweeteners, and whole spices. Indian markets all over the world sell various brands of "chai masala," for this purpose, though many households blend their own. The solid tea and spice residues are strained off from masala chai before serving. 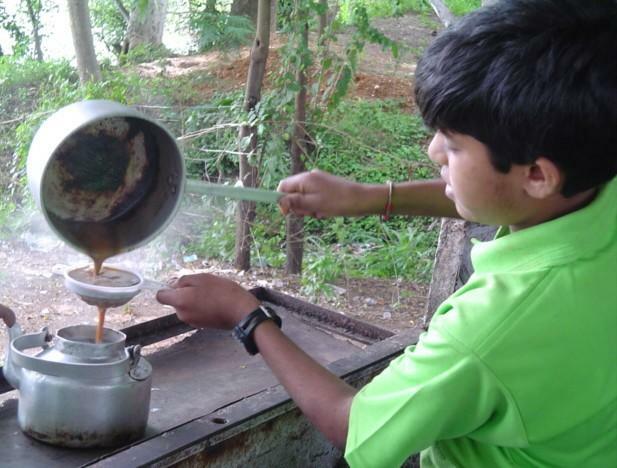 Left: A boy in Mysore, India preparing masala chai. Tea. The base tea is usually a strong black tea such as Assam, so that the spices and sweeteners do not overpower it. However, a wide variety of teas are used to make chai. Most chai in India is brewed with strong black tea, but Kashmiri chai is brewed with gunpowder tea. Sweetener. Plain white sugar is sufficient, although individual tastes may favour the caramelised notes from Demarara, other brown sugars, palm or coconut sugars, or the more complex slight acidity of honey. A surprisingly large quantity of sugar may be required to bring out the flavour of the spices; one recipe uses three tablespoons of sugar in 3 1/2 cups of chai. Condensed milk can also be added as a dual-purpose sweetener and dairy addition. Milk. Usually, whole milk is used for its richness. Generally, masala chai is made by mixing 1/4 to 1/2 parts milk with water and heating the liquid to near-boiling or even full boiling. As previously mentioned, some people like to use condensed milk in their masala chai to double as the sweetener. Spices. The traditional masala chai is a bracing, strongly spiced beverage brewed with so-called "warm" spices. Most masala chai incorporates one or more of the following: cardamom, cinnamon, ginger, star anise, peppercorn, and cloves. Traditionally, cardamom is a dominant note, supplemented by other spices such as cloves, ginger, or black pepper; the latter two add a pleasantly piquant flavour. In India, fresh ginger is often used. The Kashmiri version of chai is brewed with green tea instead of black tea and has a more subtle blend of flavorings: almonds, cardamom, cinnamon, cloves and sometimes saffron. Other possible ingredients include nutmeg, rose flavouring (where rose petals are boiled along with the loose-leaf tea), or liquorice root. Combine all of the spices and blend well in an electric grinder. You only need a small quantity for each cup of chai; store the rest for later. A full recipe will keep you stocked full of chai for months. 3/4 teaspoon dried tea leaves - to be traditional, a strong Indian tea such as an Assam is best. Add sugar, tea leaves and masala until the mixture becomes dark (about 5-10 minutes). The longer you boil, the stronger the chai. Strain into teacups to serve. Let the remaining solids cool and sprinkle them on your plants for an excellent fertiliser. Tea masala or garam masala from a store can be used to get around the masala mixture process, however preground spices lose their flavor over time. In step one, boil the water and milk separately, and in step two add the tea leaves and masala to the boiling water, boiling until the tea is as strong as you like. Only then add the milk to the mix. This can speed up the process without effecting the flavor. 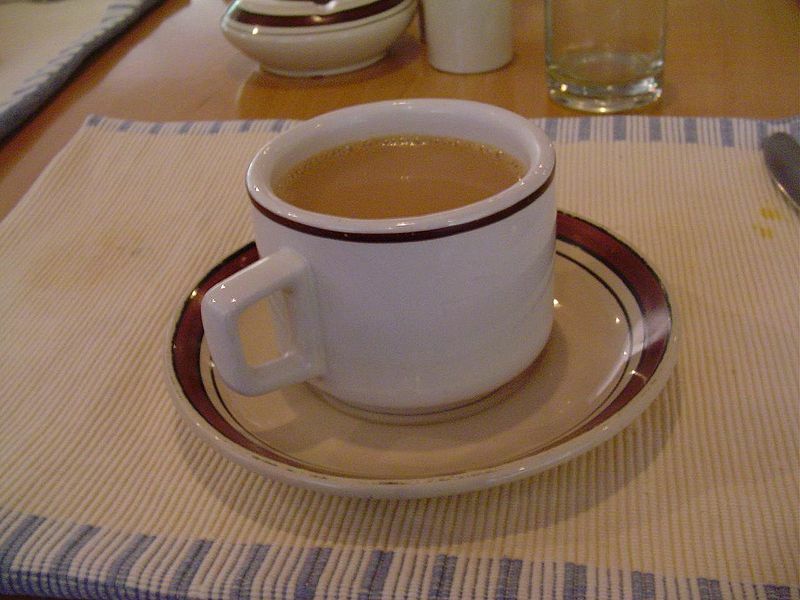 This method is often used by restaurants to serve chai in large quantities quickly as orders are taken. Optionally turn off the heat in the end, cover and let sit for about five minutes for a richer flavor. Try adjusting the ratio of milk to water. For a richer milky tea, try two parts milk to one part water. Leave out the sugar for a more adult flavor. Sugar can be added while drinking if so desired. Try other combinations of South Asian spices. Each region in which chai is commonly available has its own popular or traditional spice mix. One optional addition to masala chai is fennel seeds. Add one leaf of Indian Green Tea (called Lili Cha in local language), while the water is still boiling (before adding milk). This gives a nice flavor to the tea.